Jade knows that she must use every chance she gets if she wants more for her life, and her mother agrees. So when Jade receives scholarship to a mostly-white prep school, she takes it, along with all the other “help” the school offers. But programs that are supposed to “lift” Jade only seem to make her feel worse about her situation. She’s given a spot in a mentoring program and learns to find her voice as she pushes against the school and program’s expectations and assumptions. The book is available February 14 – buy yourself a Valentine’s Day gift! This book isn’t about romance. Jade is a dedicated student focused on her success – and she knows that it will take all of her attention, so a love interest is not something she looks for. I loved this because it’s an important perspective and one that we don’t see often enough – especially since Jade isn’t ANTI- relationships/love, she’s just focused on something else. Jade is an artistic young person and she is surrounded by women that support her, cry with her, and push her. There’s a variety of women in this book and they are all doing different things while being shining examples of how to be your ever-learning, ever-changing self. Jade’s female friendships are strong, special, and allowed to be difficult. Jade’s relationship with Sam highlighted the difficulties that arise in inter-racial interactions and highlight that friendships aren’t always easy and take work. Plus, ALL the female characters are open and honest about their vulnerabilities and the places where they need to learn and be better. 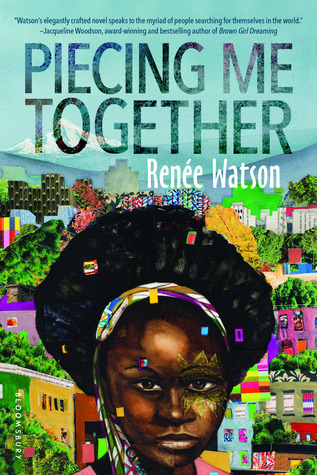 This is an #ownvoices book by a Black woman about a Black girl growing up in a poor neighborhood while having to make her way in a mostly-white world. Jade’s world is full of Black Americans making their way through life and the book centers discussions of privilege based in race and wealth. I really feel like this is a book for Black teens (as a white reader, I still LOVED it, but I’m not necessarily the intended audience and that’s ok). Even so, Sam’s character will help white readers unpack their privilege while doing a good job of showing the kind of uncomfortable conversations that true friends need to have to explore identity, privilege, and American systems of oppression (and, while that sounds really heavy, Watson does it with a light touch!). If you’re looking for other intersections (LGBTQ, disability, neurodiversity, etc) you won’t find much, if anything, here. Even so, because Jade explores, questions, and discusses the systems that affect her and her friends so deeply, I still think this deserves a high score. Watson writes lyrically, creates characters that I want to know in real life, and deftly deals with hard topics. I loved getting to know Jade and the people around her and cheered when she found her voice and stood up for what she needed and wanted. The determination, love, friendship, community activism, and art that makes up this story is why I have faith in the world getting better (eventually, even if it’s after 10 steps back). This is Jade’s book and she is amazing. An artist that sees how to create beauty from the pieces around her, she is determined to be HERSELF regardless of what other people expect or want her to be. The whole book. Watson is a beautiful writer. Always. Watson created the I, Too Arts Collective, a community arts nonprofit in Harlem based in the house where Langston Hughes lived. The organization is doing some very cool stuff. Absolutely. Always. Watson creates characters and stories that draw you in and then keep you close until the very end. She weaves words into art while also taking the reader through the difficult journeys of her characters. Plus, because she doesn’t shy away from difficult current events and issues, her books provide a safe place for dealing with your own feelings – and the endings always push you to do something in the real world. Always, always recommend This Side of Home, also by Watson. All American Boys by Reynolds and Kiely for more directly dealing with current events. Outrun the Moon by Stacey Lee for a historical look at how a Chinese-American girl pushes toward success. I received a free ARC from the publisher for an honest review. I would have read this anyway because Watson is an amazing author.